Indoor/Outdoor Fiber Cable delivers outstanding audio, video, telephony and data signal performance for educational, corporate and government campus applications. With a low bending radius and lightweight feature, this cable is suitable for both indoor and outdoor installations. Typical indoor/outdoor cables are loose tube and tight buffer designs, and we also supply ribbon cables, drop cables, distribution cables and breakout cables. These are available in a variety of configurations and jacket types to cover riser and plenum requirements for indoor cables and the ability to be run in duct, direct buried, or aerial/lashed in the outside plant. 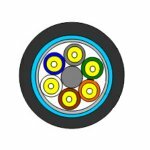 Any fiber count and cable length can be available from Fiber-Mart, and our Indoor/Outdoor Fiber Cables design can simplify your project.